Picture having your very own island escape. One where relaxation reigns, where seaside charm abounds and the pace of life is anything but hurried… welcome to Hayling Island. Sitting just off the Hampshire coast this tranquil isle is renowned for its pristine beaches and quiet countryside setting – the perfect spot for your new home away from home! In the luxurious surroundings of your lodge, you can truly rest and be free. Free from obligations, free from the commute, free from life’s everyday niggles. Whether it’s for a quick uplifting weekend away, or a month-long retreat you’ll make new precious memories each and every day. Remember the joy of simple things. Lazy morning get-ups, basking on a sun-parched beach, stargazing… a new, you-focused lifestyle begins here. 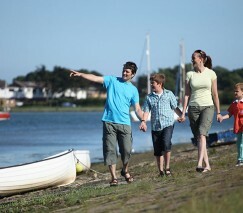 Golfing, watersports, coastal walks… Hayling Island can be as gentle or as action-packed as you choose. Top-rated on-site facilities like heated indoor and outdoor pools make every family escape effortless. Miles of unspoilt Blue Flag beaches are moments away. Luxurious touches such as modern, fully-integrated appliances make lodge living extra special.